Recognized globally as the industry's premier digital cinematography camera, Panasonic's VariCam® HD Cinema Camera has established itself as an indispensable acquisition tool delivering the distinct, prized look of film. Our P2 HD VariCam rental video cameras advance the art of high-end digital cinematography, combining the exceptional reliability and fast workflow of solid-state technology with master-quality, 10-bit 4:2:2 AVC-Intra recording; and the creativity of variable frame rates and shutter speeds to produce beautiful images for movies, documentaries and sports. The VariCam 2700 offers intuitive operation with single-step variable frame rates ranging from 1 fps to 60 fps (in 720p mode), advanced gamma settings, and essential interfaces including three HD-SDI outputs. Utilizing three 1-megapixel 2/3-inch native HD resolution CCDs, the VariCam 2700 records independent-frame 1080 and 720 images in AVC-Intra 100 and AVC-Intra 50 as well as in industry-standard DVCPRO HD. 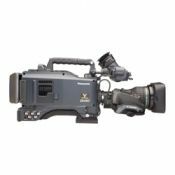 The solid-state HPX2700 offers you an ever-ready workhorse camera for a variety of professional HD shooting applications at a surprisingly affordable price. The VariCam 2700 provides the reliability and fast workflow needed in today's demanding production environments. P2 HD provides immediate access to recorded video for on-set viewing and the benefits of metadata to more easily manage your content. With five 64 GB P2 cards installed, the VariCam 2700 can record up to 400 minutes in AVC-Intra 100 at 1080/24p, 800 minutes in AVC-Intra 100 at 720/24p and 320 minutes in other other AVC-Intra 100 or DVCPRO HD formats.